Uttarakhand high court appoints itself legal guardian of cows in state, when BJP Govt there fails to protect cows in crisis. Uma Joshi | HENB | Nainital | Aug 13, 2018:: The Uttarakhand high court on Monday said it would act as the legal guardian of cows in the state, and issued 31 directions to the state government ,including setting up a cow shelter for every cluster of 25 villages and registering cases against those who abandon their cattle. 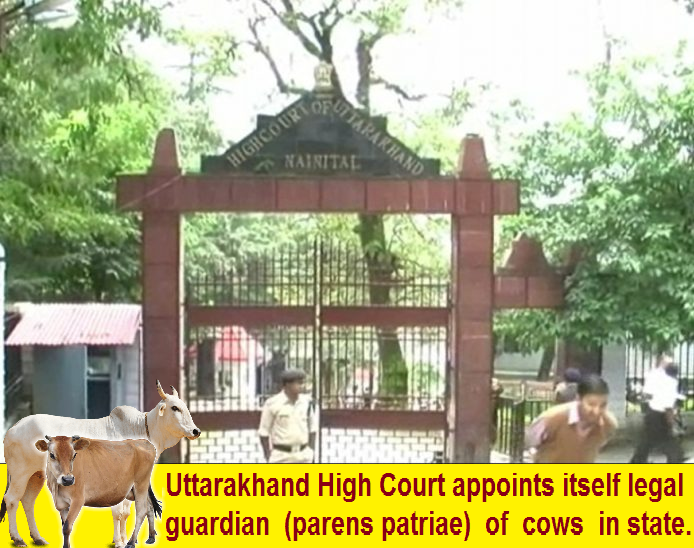 When BJP Govt in Uttrakhand fails to protect cows in crisis, the Uttarakhand high court appoints itself legal guardian of cows there in their land mark directions. The court did this by invoking the ‘parens patriae’ doctrine. Parens patriae in Latin means ‘parent of the country’ and is a doctrine that grants the court inherent power and authority to act as guardian for those who are unable to take care for themselves. A senior official of the Uttarkhand high court said that this is the first time in India that a court has had invoked the ‘parens patriae’ doctrine for cow protection. Hindustan Times wasn’t able to confirm this. Senior advocate DK Joshi explained that the court can now act as the legal guardian of the cows in the state and keep a tab on all issues related to cows especially its directions with regard to their protection. “If there are any violations in laws and rules regarding cows, the court can take suo moto cognisance and issue directions to the state”, he said. Paresh Tripathi, who represented the state government in the case, said by invoking the ‘parens patriae’ doctrine, the high court has become the voice of the cows and stray cattle in the state. In a 40-page order, the bench of acting chief justice Rajiv Sharma and justice Manoj Kumar Tiwari cited animal welfare law, national and international documents and Hindu religious texts to say that animal welfare was part of “moral development of humanity” . The court was responding to a public interest litigation filed by Alim Ali, a Haridwar-based farmer, who claimed that stray cattle were being slaughtered and waste from a slaughter house was flowing into water bodies , posing a health threat to the villagers. The court pointed out that senior superintendent of police (Haridwar) Krishna Kumar, who was summoned by the court, had informed it that “in every fortnight, two-three FIRs are registered under the provisions of the Uttarakhand Protection of Cow Progeny Act, 2007”. The court said that “it is an alarming number” and suggested cow slaughtering was prevalent in Haridwar district. “The court by invoking the ‘parens patriae’ doctrine issue following mandatory directions to the respondents in the welfare of the cows and other stray cattle,” the order read. Remarking that “it is the responsibility of the state under Article 48A to protect and improve the environment and safeguarding of forests and wildlife of the country”, the court directed all civic bodies in the state to construct “gaushalas/gausadans” or shelters/homes for housing cows and other stray cattle within one year. “No commercial charges shall be levied for supplying the electricity and water connections to gaushalas/shelters,” the order said. The court also asked the state government to register cases against people who abandon cows and owners of cattle found on the streets, roads and public places under the Indian Penal Code, Prevention of Cruelty to Animals Act, 1960 and Uttarakhand Protection of Cow Progeny Act, 2007. It also directed the state government to set up a special squad to be headed by an officer not below the rank of deputy superintendent of police in both the Kumaon and Garhwal regions with one veterinary doctor to protect cows. The court banned slaughter of cows, bulls, bullocks, heifers or calves in the state and ruled that no person shall sell beef or beef products in any form in Uttarakhand. Slaughter of cows, bulls and calves is already banned in the state under the Uttarakhand Protection of Cow Progeny Act, which provides for a jail term of up to 10 years imprisonment or Rs 10,000 fine or both for cow slaughter or selling cow meat, the court said. On July 4, the Uttarakhand high court declared entire the animal kingdom a legal entity with the rights, duties and liabilities of a living person. In 2017, the same court recognized the Ganga as a living entity and entitled to the same rights as other living entities. This entry was posted on August 14, 2018 by hinduexistence in Ban Cow Slaughter, Ban Cow Slaughter in Bharat, Cow Protection, Goraksha, Hindu Demand to Ban Cow Slaughter, Save Cow Movement, Save Indian Heritage breed Cows, Stop Cow Slaughter in India and tagged BJP Govt in Uttarakhand fails to protect cows, Cow Protection, Uttarakhand, Uttarakhand High Court.